The assistant chief of Easton’s Emergency Medical Services opened up about his battle with a chronic kidney disease Friday and says he hopes to raise awareness for living organ donations. 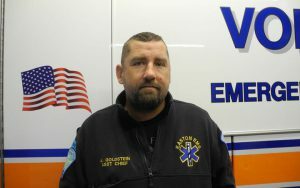 Adam Goldstein has spent 17 years of his career at Easton EMS helping save lives. Now he’s hoping someone can help save his. Goldstein beat testicular cancer in 2000, but the disease left his kidneys in decline. He received a transplant in 2006, but it failed two years later. “If you got one for me, trust me, I am very grateful — but I’d be happy just to help anybody out that’s on the (transplant) list,” he says. He says some days he feels fine. But on others, he can’t get out of bed. He’s been doing that since 2008. He needs a new kidney, and has been on the transplant list for years. But so have many other people. The number awaiting transplants for exceeds the number of available kidneys, he says. So he and Easton EMS are asking the community to see if anyone would be willing to get tested for a possible donation. Anyone willing to get tested and donate can contact the Yale Transplant Center at 866-YALE-TXP (866-925-3897), and say they would like to get tested for Adam Goldstein. For more information, email adamneedsakidney@gmail.com. Potential donors who are not Type O can still get tested for what is known as paired donation.